States of Matter Experiments and Fun! The first experiment we did this year was putting Pop Rocks in various sodas. It was actually crazy how many of my students had NEVER had Pop Rocks, so I first gave each of them some in their hand and we all ate them at the same time! I told them to keep their mouths open so we could all "listen" to them pop! Their faces were priceless! You can definitely tell who had never had them before in this picture! As you can see in the photo above, the students are writing in their science journals. I have them following the Scientific Process as we go through our experiment. There are also many great options of worksheets to use in the pack I posted above by Hope King. Below are our results. I had teeny tiny balloons, which messed us up a little bit (I blame Publix) but it still got through the concept to the students: The Pop Rocks emit gas and the gas rises to escape the bottle into any free space...hence, filling up the balloon! After our experiment, we wanted to have some fun with solids, liquids, and gases so we made root beer floats! This was super fun because this is one of the few ways you can actually EAT solids, liquids, and gasses at one time! The kids had a blast! The second set of experiments came when we talked about the properties of the different states of matter. The students received a recording sheet for the different properties we were testing: odor, density, mass, volume, color, etc. The students received these random items in cups on their trays for their group. They then had to test each item in order to record information about all of their different properties. The students below are checking for odor by wafting! These students are measuring volume using water and a graduated cylinder. Lastly, we talked about separating mixtures. I gave them a bunch of various materials in cups (similar to the experiment above) and they had to use their recording sheet to record how the mixtures were separated. I gave them tools for separating, too; however, they didn't know which tools would work for which mixtures. I also gave them a few random things that looked useful, but were not, to test them! Remember, the key for separating mixtures is that there may be more than one way to do it, but you need to know which way is the best and most efficient for separating! Below you see students using a magnet to quickly separate paperclips and M&Ms! The students below are using a screen (sieve) to separate sand and pebbles. Here is a group that tried to prove to me that the easiest way to separate sand and pebbles would be using their hands.... What do you think happened? We then discussed ALL of the different ways that we found useful for separating mixtures and posted them to our discussion board you see below. This stayed up for a while and we were even able to add a little bit to it when we talked about other mixtures in science as the days passed. New pack posted! Being pregnant has definitely caused me to be a little "slow" in getting the things I want to post up on Teachers Pay Teachers. Finally...at 7 months...I posted something! Feels like a major accomplishment...I'm not going to lie! We also get to play with series and parallel circuits in this pack! 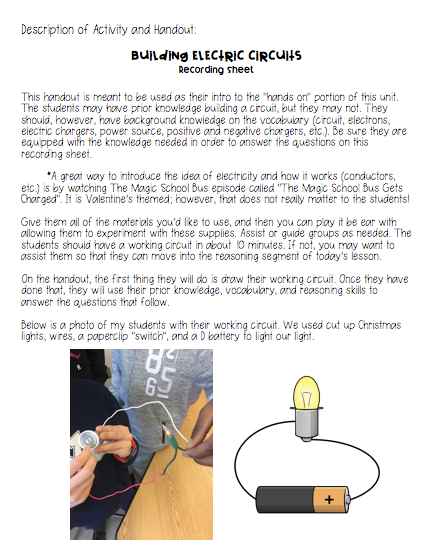 The pack starts off by having your students experiment with simple circuits. They get to play with the wires, lights, batteries, etc. This allows them to gain the understanding of why a circuit works the way it does, and what happens when it is an open circuit. 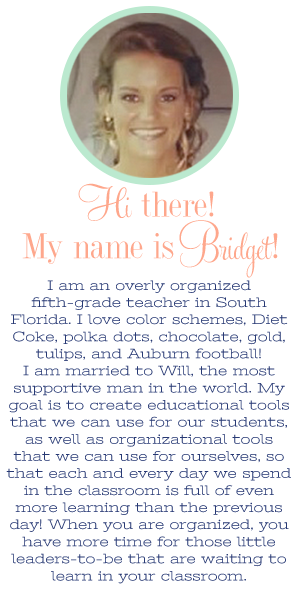 Each classroom handout/recording sheet/activity comes with a description page before it. This page explains what will be happening when your students do the following activity. It also explains what vocabulary and concepts they should have prior knowledge of before doing the assignment or experiment. 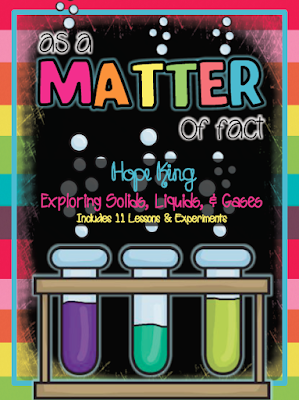 This pack is not meant to fully replace anything you've used to teach in the passed, but meant to ADD "hands on" activities to your curriculum, in a STEM-like way. These students figured out how to get their light bulb to light using the materials I gave them! 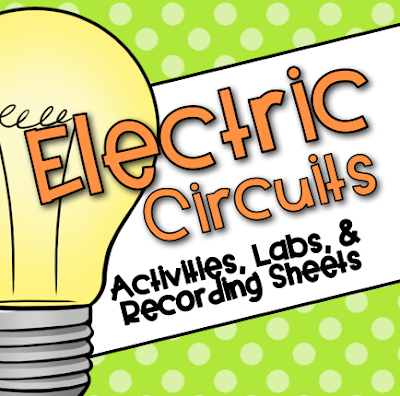 When it comes time to play with the series and parallel circuits, the students are able to follow the pictures on the recording sheet in order to build the circuits. This is because by the end of the pack, they are so familiar with the materials that they don't need very much direction! The last parallel circuit was a bit hard for them to build on their own, but with little help, they were really successful! It was really great because they did not expect it to be parallel, but when they unplugged one of the lights and the other one stayed ON they were SO SHOCKED! The students answer thought-provoking reasoning questions on their recording sheet after each circuit they build. Cut and sort activities, as well as experiments with the wires, for conductors and insulators are also included. Below you can see a student working with the cut and sort activity. The item that shocked most of them? Concrete is a conductor! I love how this student got creative when we glued our cut and sort activity pieces to construction paper. The word "conductors" allows electric charges to pass through it, while the word "insulators" does not! First off...I am sorry for the glare! The 7 months pregnant Mrs. Pearsall is not allowed to stand on chairs or desks...so....I had to get the best picture I could from the ground! The glare was totally unavoidable!! I knew you all would forgive me! I am obsessed with banners still...I don't know if they have gone out of style yet...but I still LOVE them so much! 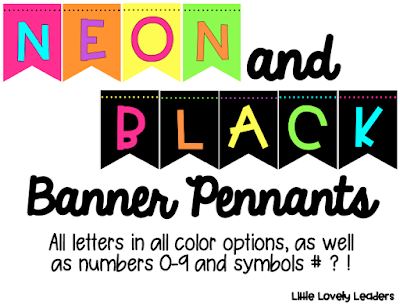 I love the versatility of them - you can print a bunch of letters and then constantly create new banners with them! It's so great! I prefer this over di-cutting letters any day! Ever want to make your regular banner just a little bit cuter?! I love doing this by adding lots and lots of small pieces of ribbon! Then you just cut a bunch of small pieces of ribbon and double knot them - without any worries about how it looks! It actually doesn't matter, for once! That's it! It is actually really fun to teach the students how to do this and allow them to take part in helping to create my future banners! You can see this banner below, without all of the added ribbon pieces, and how it is just a tad boring! It is just so super easy to solve that problem! The letters for these banners can be found in the packs below if you're interested. 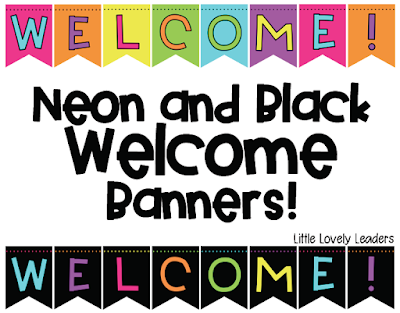 One pack is just the "WELCOME" banner letters and the other pack has all of the letters so you can create endless banners for your neon rainbow classroom throughout the year! Teachers - masters of finding new tricks each year because the group of kids and their needs change each year! This year's trick: Taking turns to solve math problems! 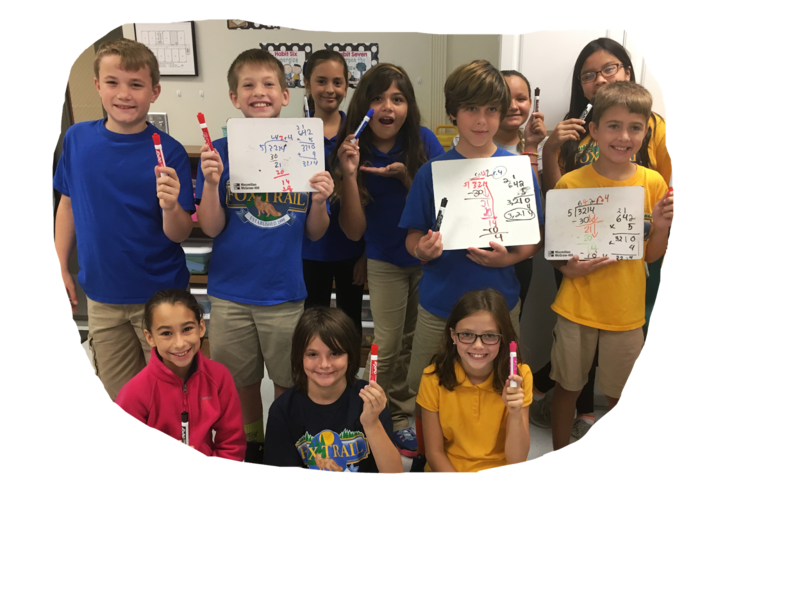 The students are holding their markers up so you can see what color they had - this is because they took turns in solving the problem on their group white board. They can see what part they did by looking for their color. My favorite part: this game was done in complete silence! 1 - you must watch the members of your group solve their part of the problem so that you can catch any mistakes and so that you know what you are doing when it is your turn. 2 - if you catch a mistake, you cannot speak, so you must fix it when it comes to your turn. 5 - if someone is stuck when it is their turn, the next group member may help them by doing one part of the step to get them started. I could NOT believe how successful this was in my class this year! Long division was like torture for this group, until they were responsible for a part of a problem in a team and they knew their team would be expecting their work to be done right! Amazing how hard they work when their team depends on them! They actually took responsibility for their learning because their team members were holding them accountable! Sometimes it's okay if it is not always the teacher holding everyone accountable for everything...sometimes we can let them hold one another accountable! Just like we, as adults, care about doing our work properly around our peers. I think we can all agree, though, that we don't mean just ANY parent involvement...we mean the kind where the parents are directly involved in their kids' learning. This is where I got the idea for MATH NIGHT! A night of parents and students....and math! To be honest...the idea really stemmed from my frustration with hearing parents say that they feel that they cannot help their child at home on their math homework. Not that I always want the parents to help the kids...I want them to do it for themselves....but it is nice if the parents feel that they are able to help where they can. It definitely helps the students if the parents 'help' and don't just "do it to get through it". After scratching my head for a while trying to figure out how to teach the parents these skills AND make it more fun for the kids, I came up with Math Night. The parents must attend with their children. I am not offering free tutoring here! Haha! 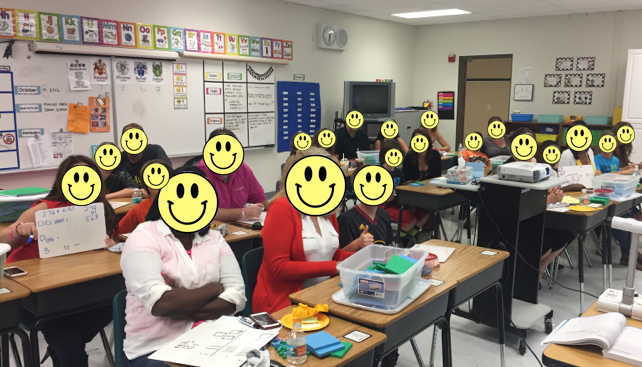 However, the parents and kids come together, sit in my math classroom, and learn the concepts that are coming in the near future in math. 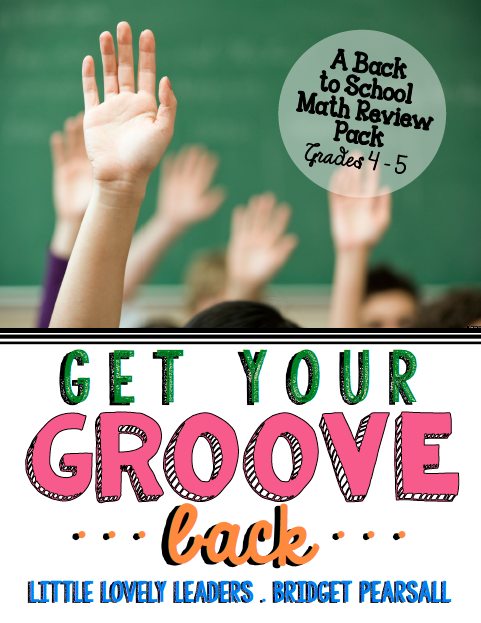 This allows for the students to learn the upcoming math skills a little bit ahead of time, and allows the parents to know what is coming home on their homework soon! Something I did not foresee, though, was what great results I would get! I was really excited about the parent turn-out for math night, but that's not all! 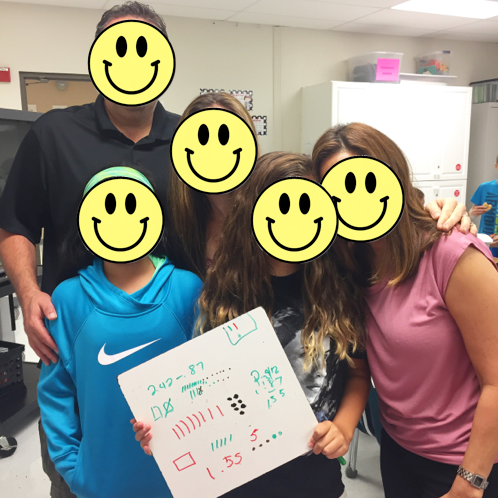 Students got to see their parents trying the fifth grade math problems on their own whiteboards, while sitting at fifth graders' desks in a classroom. The parents struggled sometimes to get the new topics, but they always showed to be successful in the end! They watched their children learn new things AND their children got to see them learn new things! When do fifth graders get to see their parents learn something new, struggle with it, and then overcome it? Hardly ever! This is a super important thing for children to witness their parents doing. I did not expect the importance of it, but now I know it exists. Below is a photo of a game we played at the very end of the night. The rows of parents and students became a "group" or "team". I displayed review problems from skills we learned throughout the night. The members of each team had a different color marker and they had to take turns, each doing 1 step of the problem before the next team member did a step. This way, they were all paying attention to what each person was doing so that they could see if the member was doing it correctly AND so that they would know what step they were responsible for next. 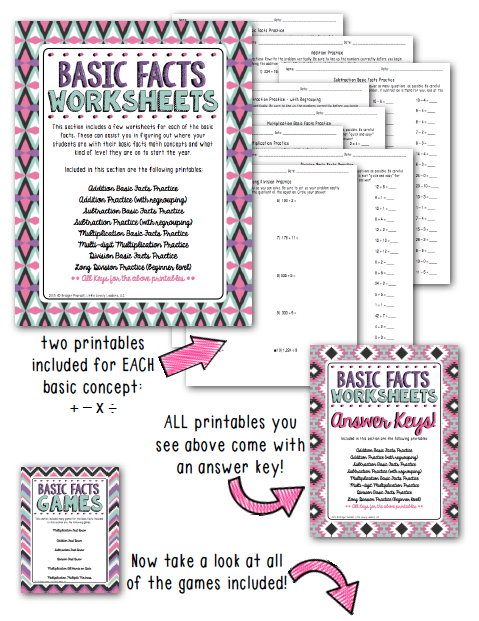 This pack contains two printable worksheets for each of the basic facts (addition, subtraction, multiplication, and division). There are answer keys for every page. These should give you a good feel for how each of your students are doing. It's always a good idea to get a feel for their levels when you first get going with this pack. This way, when you start using the practice games, you can group them the way you feel will be best for their learning. Sometimes, you may choose to have a high level math student paired with someone performing on a lower or average level, so they can help them. However, sometimes you may want students competing in the games who are all competing at the same level, this way the game is more fun for everyone and will still work on their skills. The 6 games, as seen above, are all printable in black and white. They are best printed on colored paper so that students cannot see through them to the math problem when the cards are upside down. Below, the students are playing "Addition Fast Draw". They each flip one of their cards and quickly solve the math equation. Whoever wins by saying their fact the fasted (and accurately!) gets to keep both cards. At the end of their decks, the player with the most cards wins the game. 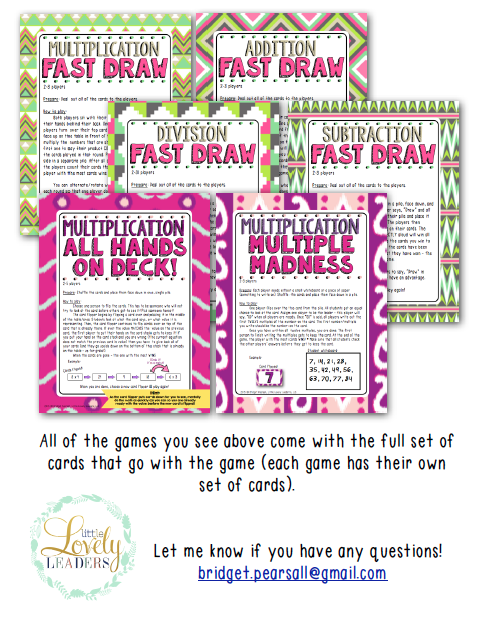 The other "Fast Draw" games have the same rules, but for different operations. This makes it easy for students to go and grab the game they need the most practice in, without having to learn so many different game rules.